RefutableCow69 is right. You have to remove Games for Windows LIVE to get this to work. I know these post are old now and that Games for Windows LIVE is obsolete now. But a lot of old guilds on youtube would tell you that you need it to have it installed in order for Fallout 3 GOTY for steam to work without any errors popping up. Even though that going to happen either way. 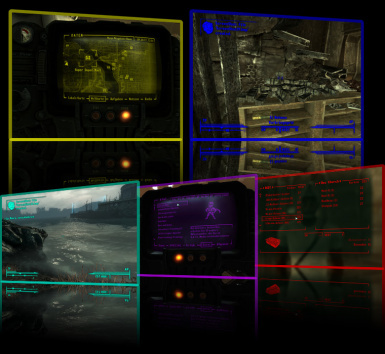 So if your willing to play without GFWL to have this mod work. Then go for it! So how do i actually change it back to vanilla? Can't vote or endorse but congrats , nice work ! Very gud, m8. I like it. I see people have found it to work but I on the other hand get no changes in game whatsoever from it. 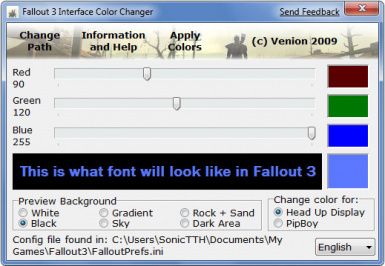 did you change the path to MyDocuments/Mygames/Fallout3FalloutPrefs ? Yes, I know this post is old, but for anyone having this same problem, Games For Windows Live disables the color changing. So just don't use GFWL and it should fix itself.